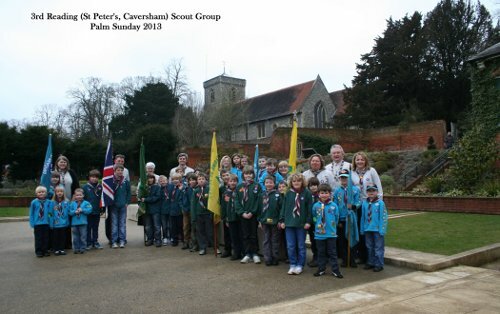 3rd Reading (St Peter’s, Caversham) Scout Group now caters for over 250 young people between 5 to 18 years old and each section holds their weekly meeting at The Scout Hut in Grove Hill. A full programme of events is one of the key factors in maintaining interest within the sections and through the wide range of activities our aim is to help the children develop, physically, mentally and spiritually. Over the last year the young people have been very active and have enjoyed indoor and outdoor camping, cycling, hiking, kayaking and rafting and making & eating pancakes to name just a few. We have entered teams into chess competitions, cooking competitions and swimming galas winning many medals and trophies. All sections enjoy camping experiences, Beavers held their first sleepover at Paddicks Patch in November, Cubs are off to Dorney Wood in June and Scouts/Explorers have already enjoyed Winter Camp and Easter Camp this year and are now looking forward to their Summer Camp in Wales. The boys and girls all enjoy working towards activity badges and wear them on their uniforms with pride, but above all scouting is about friendship, helping others and having fun! We have an excellent team of leaders, helpers and committee members who freely give their time to what is a brilliant social activity and incredibly rewarding.